Scientists in Japan have developed a portable influenza testing kit with better accuracy than current methods, which can give a result in 30 minutes. Scientists from the Tokyo Medical and Dental University and Sony Corporation made a nucleic acid amplification testing (NAT) device that not only gives information on the sample’s genetic make up to identify the flu pathogen type, but is also more than 90 per cent accurate. The device works by detecting the genes of the influenza virus pathogen – an organism that causes the disease – which gives information about the virus subtype and drug resistance. Current rapid diagnostic kits to detect the flu virus suffer from low accuracy (40-69 per cent) and don’t provide genetic information about the sample. One NAT in use to test clinical specimens is real time reverse transcription polymerase chain reaction, which involves amplifying, detecting and quantifying DNA sequences. It does give genetic information, but it consists of a complex procedure and takes 3-4 hours to produce results. 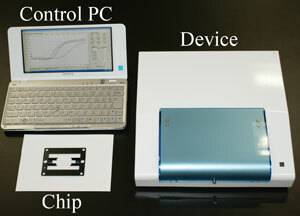 Sony’s detection system comprises: a laptop to control the system; a device for heating samples and detecting fluorescence; and disposable testing chips. The chips contain reaction wells made of polydimethylsiloxane sandwiched between two glass sheets in a vacuum chamber. Samples are injected into the wells through a port by a disposable injector, eliminating the need for pumps and tubing. Chinese scientists have developed a much easier way to make the short strands of RNA that are an essential tool in understanding what genes do. Short interfering ribonucleic acids (siRNAs) were first discovered in 1999, and found to interfere with the expression of specific genes, giving them a key role in controlling the molecular machinery in living organisms. Though initially identified in plants, they were later found in animals too, and this spurred an interest in using them as tools to investigate what specific genes do in the body. One type of siRNAs, endoribonuclease-prepared siRNAs (esiRNAs), has recently attracted attention because of their greater specificity and their cost effectiveness. Jianzhong Xi and colleagues at Peking University have now demonstrated a lab on a chip method that makes large scale manufacture of esiRNAs much easier. The chip consists of 96 pins. Each pin has a polymer bead at its end in which a number of DNA probes are immobilised, allowing hundreds of esiRNA products to be manipulated at the same time.